Russian President Dmitry Medvedev (centre) and leaders of the ASEAN Member States pose for a group photo before the start of the Second ASEAN – Russia Summit. From left - President of the Philippines Benigno Aquino, Prime Minister of Singapore Lee Hsien Loong, Prime Minister of Thailand Abhisit Vejjajiva, Prime Minister of Vietnam Nguyen Tan Dung, President of Indonesia Susilo Bambang Yudhoyono, the Sultan of Brunei Hassanal Bolkiah. Russian President Dmitry Medvedev (sixth from the left) and leaders of the ASEAN Member States pose for a group photo before the start of the Second ASEAN – Russia Summit. 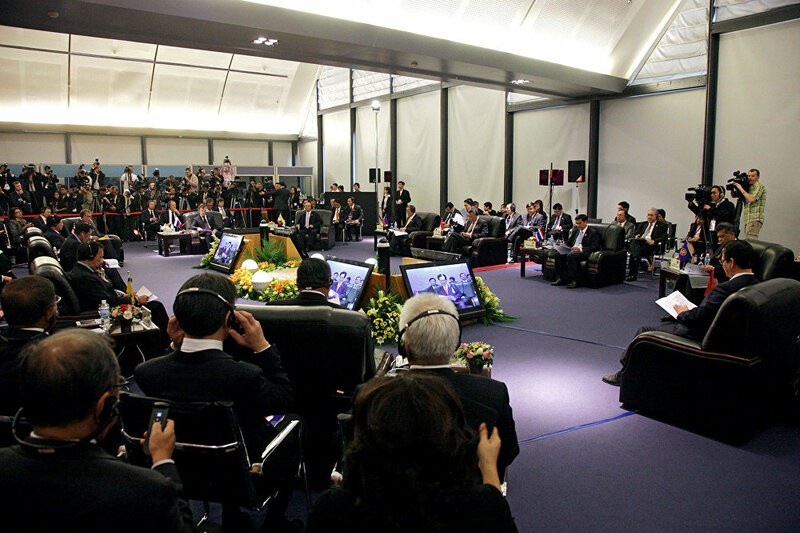 From left: Prime Minister of Malaysia Najib Razak, Prime Minister of Myanmar Thein Sein, President of the Philippines Benigno Aquino, Prime Minister of Singapore Lee Hsien Loong, Prime Minister of Thailand Abhisit Vejjajiva, Prime Minister of Vietnam Nguyen Tan Dung, President of Indonesia Susilo Bambang Yudhoyono, the Sultan of Brunei Hassanal Bolkiah, Prime Minister of Cambodia Hun Sen, Prime Minister of Laos Bouasone Bouphavanh, ASEAN Secretary- General Surin Pitsuwan. 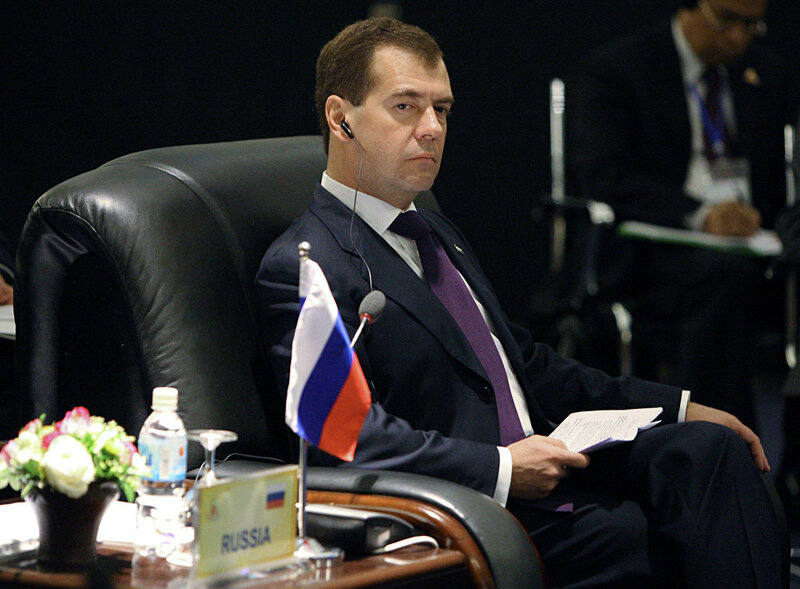 Russian President Dmitry Medvedev at the Second ASEAN – Russia Summit. 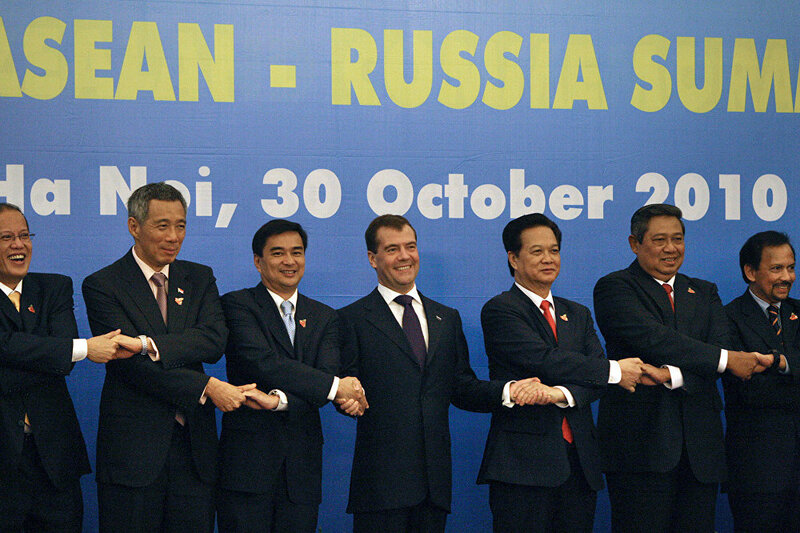 Russian President Dmitry Medvedev (right) at the Second ASEAN – Russia Summit. 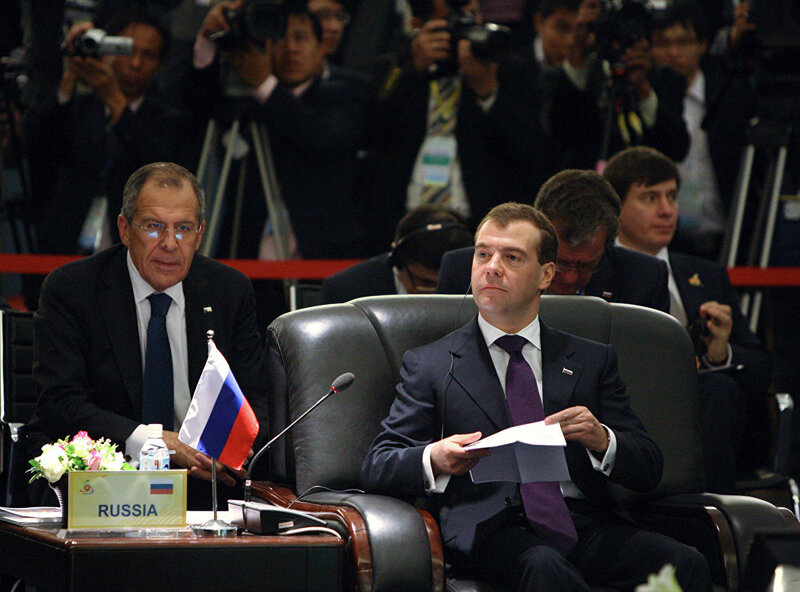 On his left is Russian Foreign Minister Sergei Lavrov. 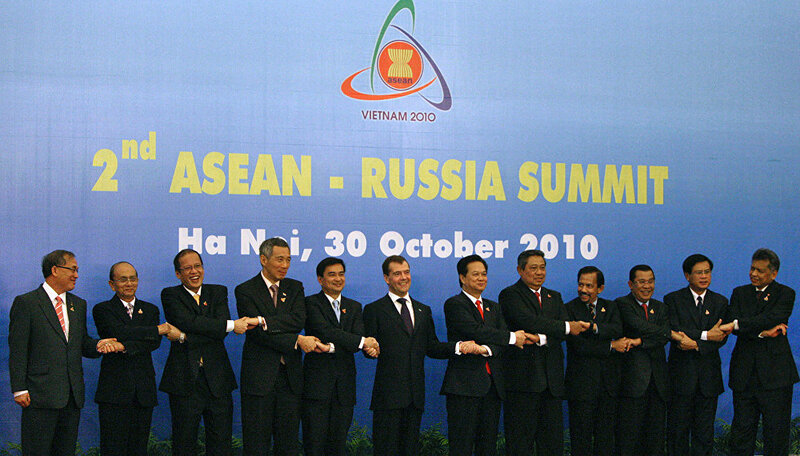 Second ASEAN – Russia Summit. 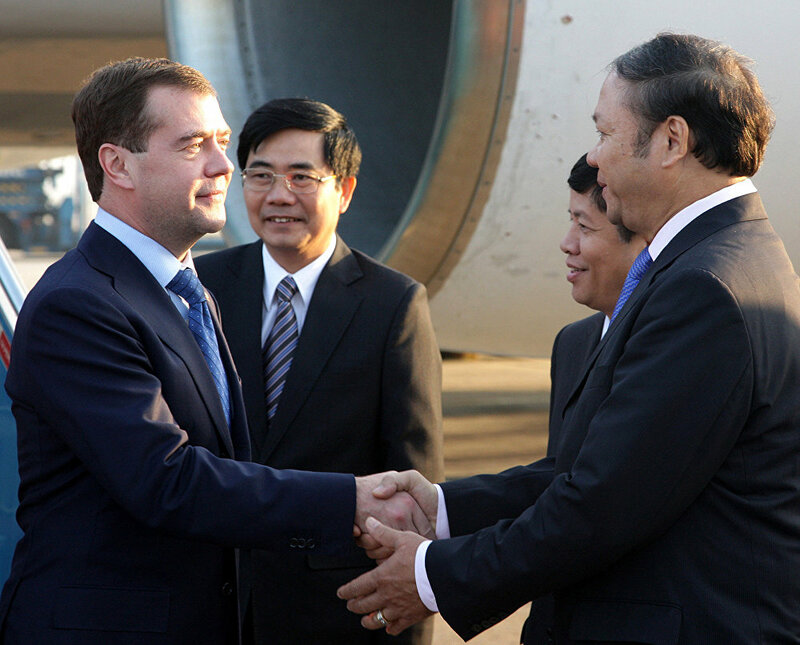 Russian President Dmitry Medvedev (left in the foreground), arriving to attend the Second ASEAN – Russia Summit, during a welcoming ceremony at the Hanoi Airport. On the right in the foreground is Ambassador Extraordinary and Plenipotentiary of the Socialist Republic of Vietnam to Russia Bui Dinh Dinh. 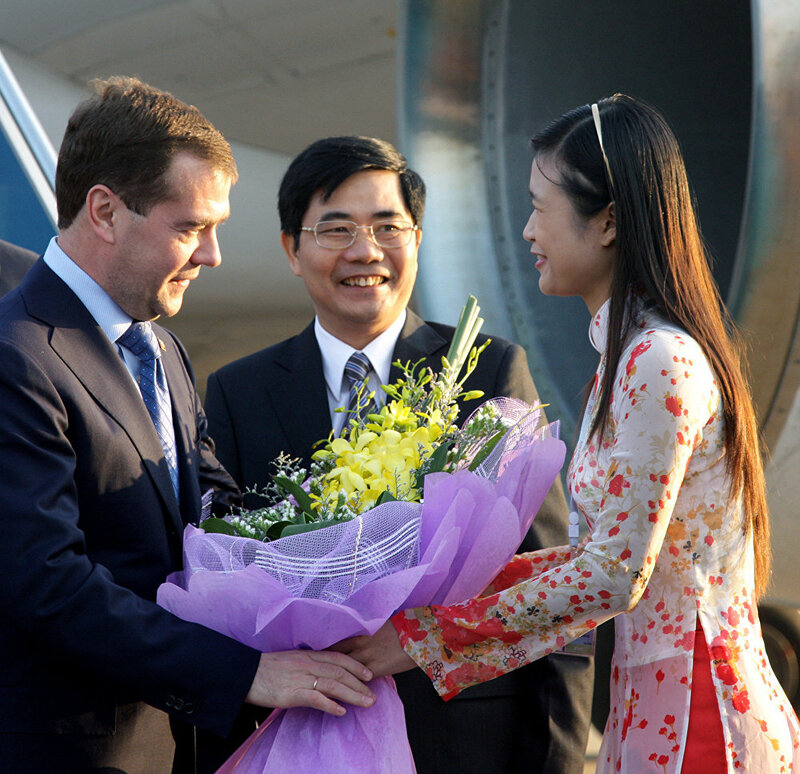 Russian President Dmitry Medvedev, arriving to attend Second ASEAN – Russia Summit, during a welcoming ceremony at the Hanoi Airport. 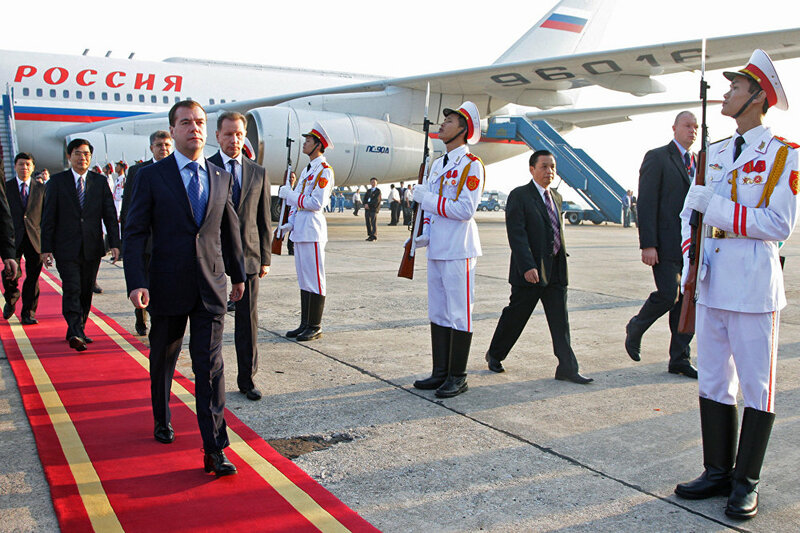 Russian President Dmitry Medvedev, arriving to attend the Second ASEAN – Russia Summit, during a welcoming ceremony at the Hanoi Airport.